Roger Federer saved four match points before securing a dramatic 4-6 7-5 7-6(6) win against Stan Wawrinka to book a showdown with Novak Djokovic for the World Tour Finals title. The world No.2 came from a set down to win a third-set tie-breaker against the man he will line up alongside for Switzerland in next weekend’s Davis Cup final. At two hours and 48 minutes, it was by far the longest match at the tournament and just the fourth to go to three sets. “I think I’m very lucky tonight,” said Federer. “Stan played better from the baseline. I kept believing, kept fighting. He did all the right things, it was tough. 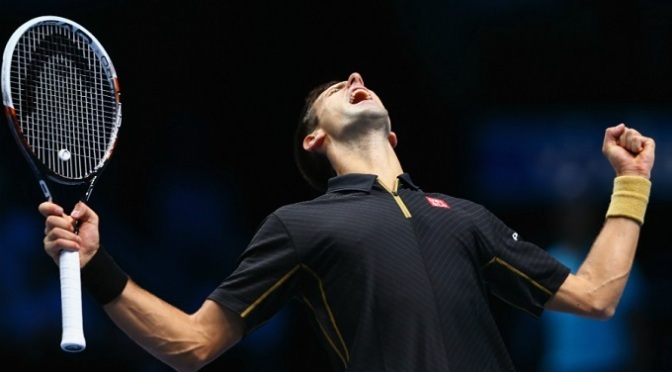 But I’m thrilled to be in another final here in London. 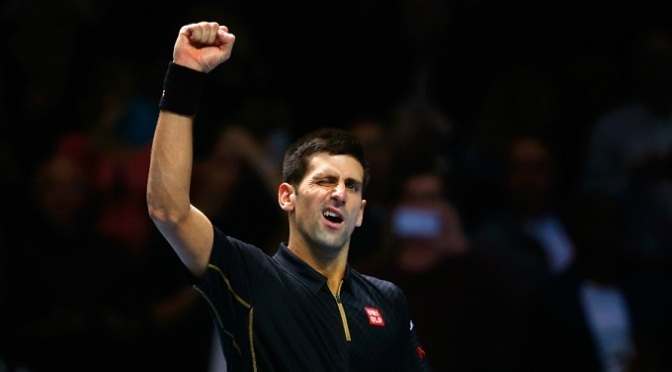 “I’ve saved a lot of break points, match points in the last few months. I thought, let’s try to do it one more time. I feel very lucky to be doing this interview right now. Federer, featuring in a record-equalling 12th semi-final at the event, had saved all seven break points he had faced this week, however, Wawrinka managed to break him not once but twice for a 5-2 lead in the first. The world No.2 pulled one break back, but Wawrinka held serve to close out the set in 35 minutes. Wawrinka then managed to save three break points to keep the second set on serve at 3-3, though, serving to stay in it, he dumped a simple overhead into the net to gift Federer three set points. Federer duly took his first with Wawrinka planting a backhand into the net. Federer, bidding for a ninth final at the event, was immediately broken to love in the decider, though, having remonstrated with the umpire at 0-40 after claiming he didn’t hear an overrule so challenged too late. Wawrinka then denied Federer by saving two break points and going 5-3 up to close in on victory. A dramatic next game saw Federer save three match points before taking his second break point to stay in the match, with the O2 Arena erupting. The drama didn’t end there. Federer was then forced to save two break points before going 6-5 ahead, with Wawrinka holding to ensure a tie-breaker. 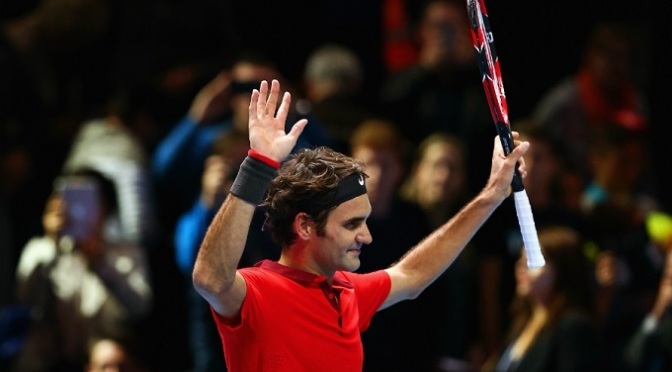 Federer raced into a 2-0 lead before Wawrinka battled back to lead 6-5. However, Federer saved match point again before bringing up his first, taking the tie-breaker 8-6 to secure the win. 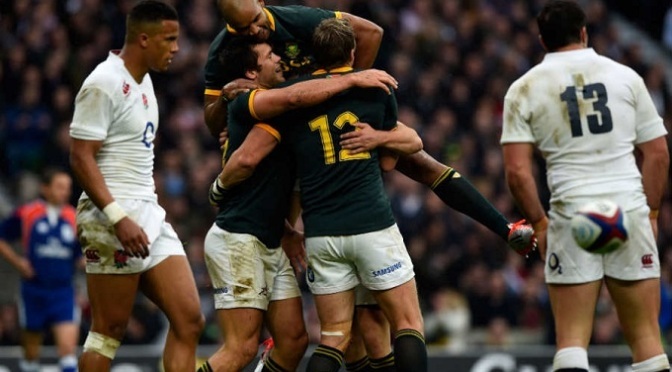 England fell to their fifth consecutive defeat as South Africa profited from another disappointing display. Trailing by 14 points early in the second half, England responded with back-to-back tries from driving mauls for David Wilson and Ben Morgan. But a burrowing try from Schalk Burger and 13 points from the boot of fly-half Pat Lambie made it 12 matches in a row since England last beat the Springboks. Despite their stirring fightback, England only seldom exerted any control, errors from half-back pairing Danny Care and Owen Farrell costing them at pivotal moments. With just 10 matches to go until the World Cup, England’s development as a team appears to have stalled, with the first serious questions being asked of the Stuart Lancaster regime. Lambie opened the scoring with a straightforward penalty after Farrell’s ill-judged decision to run from deep put his side in trouble, and a more serious error then gifted the visitors a more significant score. 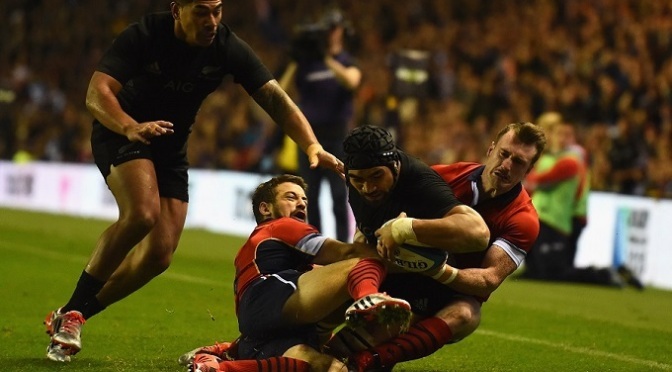 Care, winning his 50th cap, threw a slow, telegraphed pass after a stodgy series of attempted drives and centre Jan Serfontein intercepted to race away and under the posts from 60 metres. Lambie’s conversion made it 10-0, and England were struggling – slow in thought, obvious in execution, Twickenham muted. Northern Ireland’s three-game winning run in their Euro 2016 qualifiers ended as Romania won in Bucharest to go top of Group F.
Full-back Paul Papp scored both goals, firing into the top corner in the 73rd minute and stealing in to convert a back-post header. Chris Brunt went close early on but Alexandru Chipciu hit the bar and Bogdan Stancu missed from close range. 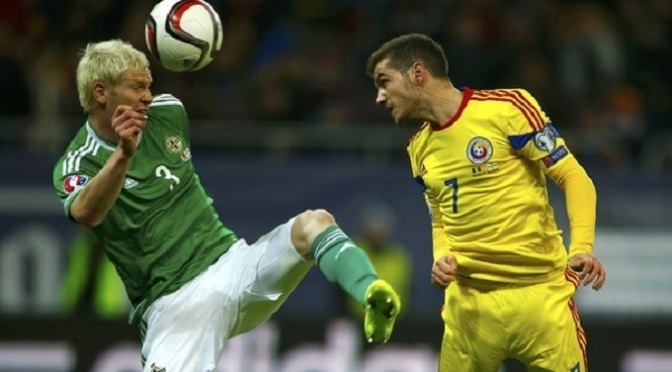 Northern Ireland slipped to second in the group, one point behind Romania. Romania began the first European Championship qualifying meeting between the sides hoping to avoid a repeat of their only previous competitive home match with Northern Ireland, a World Cup qualifier in October, 1985, which they lost 1-0. Michael O’Neill’s Northern Ireland went into the game full of confidence but without several injured players, including skipper Steven Davis. Anghel Iordanescu was beginning his third spell as Romania coach following the departure of Victor Piturca, who left to take up a lucrative deal with Saudi Arabian side Ittihad last month. The hosts, also without several first-choice regulars, began brightly and a bicycle kick by out-of-favour Tottenham defender Vlad Chiriches was gathered by Roy Carroll. A superb Shaun Maloney goal earned Scotland a precious and hard-fought victory over the Republic of Ireland in their Euro 2016 Group D qualifier. From a short corner, Maloney squeezed the ball into the feet of Scott Brown, whose back-heel allowed the winger to curl an exquisite shot home. There was a late scare for the Scots as Grant Hanley’s header hit his own bar. They now draw level with the Irish and Germany on seven points after four games, with Poland three points clear. Former Celtic manager Martin O’Neill had spoken of his belief that his Irish side could win on his return to Celtic Park. Instead, it was his successor at the club, Gordon Strachan, who enjoyed the happier homecoming. Another of the pre-match talking points was the expected booing of the Scots-born Ireland winger Aiden McGeady and his reception was suitably hostile – he was treated by the home fans as the pantomime villain. From the outset, the pace of the game was frenetic. The tackling was tenacious and, at times, downright careless, leading to early bookings for Hanley, McGeady and his Ireland team-mate, Jeff Hendrick. The passion on show almost made up for the dearth of football, with precious few chances created in the opening half-hour. Jon Walters and Darron Gibson did force David Marshall into saves, but there was little to worry either goalkeeper. Scotland’s play under Strachan has come to be typified by slick attacking play and it was one such passage that almost brought about the opening goal. Steven Naismith foraged away before picking out Maloney on the right. The winger’s cross was whipped in for the charging Charlie Mulgrew, but his header flew wide. Caterham’s administrator says the team will race at the season-ending Abu Dhabi Grand Prix following the success of a public crowd-funding project. The team went into administration last month and had been seeking to raise £2.35m in order to return to action. “We set ourselves a major challenge, but it’s been worth it. In only a week the fans have made the impossible possible,” Finbarr O’Connell said. 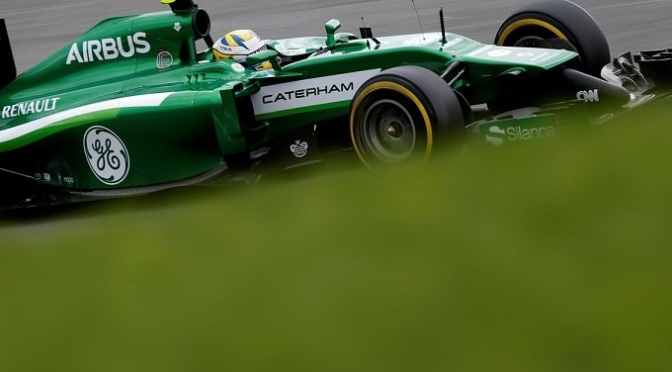 Caterham sat out the last two grands prix in the United States andBrazil. Although the team is currently just under £500,000 short of its target, sponsors have come on board to make up the shortfall. The crowd-funding initiative offered rewards to investors ranging from Caterham-branded earplugs and caps through to used race suits and carbon engine covers. O’Connell, representing administrator Smith & Williamson, added: “We knew that the best way to keep this team alive and attract possible buyers was to show that it’s still a racing team and be in Abu Dhabi for the finale. “There aren’t enough words to say how grateful we are to all the fans who have made this possible. Equatorial Guinea have been named as the hosts for the 2015 Africa Cup of Nations, the Confederation of African Football has confirmed. Caf selected a replacement for Morocco after rejecting their request to delay the 17 January to 8 February finals. Morocco were concerned over the spread of the outbreak of the Ebola virus. Equatorial Guinea will now take on sole responsibility for holding the 16-team event. Caf said the decision was made after a meeting in Malabo on Friday between Equatorial Guinea’s president Teodoro Obiang and Caf president Issa Hayatou. African football’s governing body also announced that Equatorial Guinea will play in the tournament – despite the team being disqualified in July for fielding an ineligible player in a preliminary qualifier against Mauritania on 17 May. Hayatou said in a statement: “The head of state of Equatorial Guinea agreed to host the competition. “As a result, the Caf executive committee confirms that the tournament will go ahead and Equatorial Guinea will compete as the host nation. Matches will be held at four venues in Bata, Ebebiyin, Mongomo and the capital Malabo. In 2012, only Malabo and Bata were used. The draw for the finals will be in Malabo on 3 December.